Nova Scotia Nature Trust – Daphne Carter—Small Change Adds Up! Daphne Carter—Small Change Adds Up! 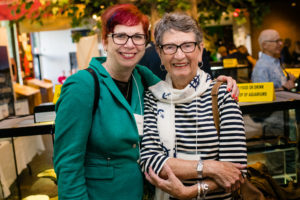 Daphne Carter (left), with Nancy Margeson (right) at our 2018 Conservation Showcase. “Small change makes a big difference!” says Daphne Carter, and that’s why she chooses to donate monthly to Nova Scotia Nature Trust. *Examples of Round-Up apps include Mylo and Donate Your Change. Round-Up apps have been available in the US for the last few years but only recently entered the Canadian scene.